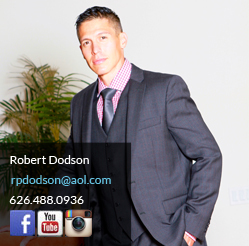 Robert Dodson is a licensed Real Estate Broker of his own firm in Los Angeles, California. He has been representing individuals, couples, and companies for over (13) years. Robert has mastered every aspect of Real Estate. Starting at a small company in Diamond Bar, he acquired the necessary skills and expertise to become proficient in helping consumers buy & sell homes. As the years went on, he began representing his sophisticated clientele in purchasing Vacant Land as well as Investment Property. Eventually, he took his leadership skills to Countrywide Home Loans where he learned the finance side of purchasing a home. With his well-rounded experience in all areas of the industry, he then pursued the coveted: Broker’s License. Robert’s ability to listen and understand his client’s needs has allowed him to continuously achieve his client’s goals and expectations. His personable and professional character allows him to build and maintain solid relationships, which explains why his business continues to grow from referrals and repeat clients. On a personal note, Robert was born and raised in Los Angeles, California. He graduated in 2000 from Cal State Fullerton. His hobbies include running, working out, and playing basketball. Despite Robert’s busy schedule, he still finds time to pursue the entertainment industry. He has been featured on numerous shows such as: Entourage, The Ellen Show, CSI: NY, CSI: Miami, Castle, Betty White’s Off Their Rocker, along with The Client List & Desperate Housewives.